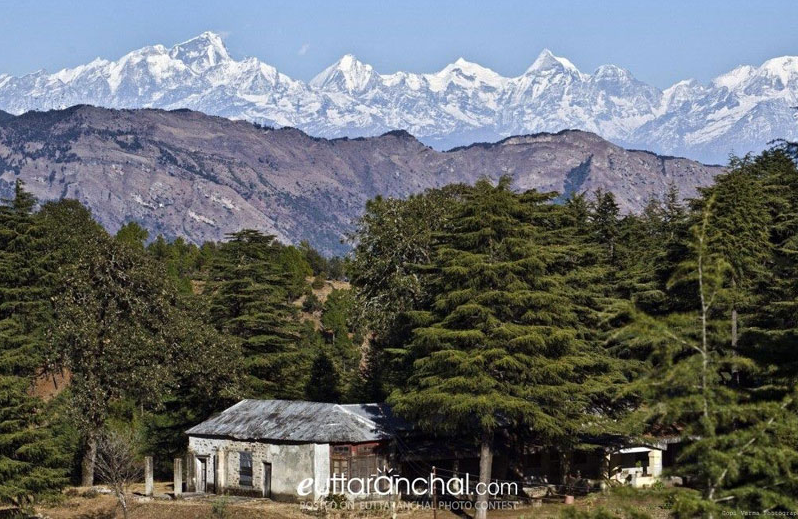 Cliffed atop a hill, the dwarf hill station of Abbott Mount is snuggled in the Kali Kumaon region of Champawat district. This picturesque hill station is perched at an elevation of 6,400 feet and is encircled by a cluster of thirteen cottages, sprawling over five acres of woods. The tiny hamlet also features a lovely church offering spiritual bliss to the visitant. The Abbott Mount is also the base camp for the Mahaseer fishing in Pancheshwar, the confluence of Saryu and Mahakali rivers. The rustic European bungalows with well-manicured gardens and a big playground atop Abbott Mount often entices the visitors and narrates how life once breath in this quaint place. The mornings are a little special here as the luscious valley is drenched in the misty dew drops of nature, which gives a tingling sensation as one sets its foot on the feisty green grass. If you are a nature lover then you must visit this place as Abbott Mount is blessed with dense sub-temperate vegetation and is rich in varied Himalayan wildlife. You can also enjoy bird watching, trekking and nature walk here. Summers are blissful here as a wide variety of butterflies spread their colourful wings to paint the town in their dewy colours. The winters are also pleasant here. If you have an inclination for spooky, mysterious and eerie places then this place is for you as Abbott Mount is also known as one of the India’s most haunted places. It is believed that in one of the bungalows of Abbott Mount a doctor by the name of Morrison used to perform some dreadful experiments on the locals in the 1920s. According to the locals, the spirits of those patients haunts in 'Mukti Kothri', one of the rooms of the old bungalow. Abbott Mount is unlike your tourist hotspots Mussoorie or Nainital that offer every possible facility a tourist can think of. It is a quaint hamlet that has managed to keep its charm for over a century! The facilities are very limited at Abbott Mount. So, keep that in mind when you travel to Abbott Mount. Being a relative obscure hamlet amidst the Kumaon hills, there is no ATM, Petrol Pump station or even a restaurant at Abbott Mount. One can find all these at Lohaghat which is 7kms before Abbott Mount. The power supply at Abbott Mount is erratic, so expect load shedding every now and then. But who needs electricity when you are amidst nature, right? Start a bonfire instead. Like every other hill station, it can get chilly at Abbott Mount, especially at night. So tourists are expected to dress warmly. Lastly, respect the nature and the locals you meet and avoid polluting the region. It is advisable to take back any non-biodegradable things back with you as there is no proper disposal system at Abbott Mount. In order to preserve the tranquility and serenity that captivates this private hill station, there are only a handful of accommodations set up in Abbott Mount. Well, thirteen, to be precise. These 13 warm, secluded and comfortable cottages are peppered all over the hillside offered great views of the snow-capped Himalayan ranges. The tariff, however, is a reasonably expensive, given the location, cuisine, and the home-away-from feel these well-maintained cottages provide. If cottages are not of your taste or they are a bit expensive for your budget, one can easily find accommodations that are plentiful in Lohaghat, just 7 kms from Abbott Mount. Since the only accommodations available in Abbott Mount are the privately maintained cottages, there are no restaurants or cafes set up at Abbott Mount. Some cottages include food in the package deal they offer to customers while others request tourists to bring their food supplies with them. The kitchens are equipped with cooking and dining utensils while caretakers will help in cooking and housekeeping. It would be best to inquire beforehand about the food arrangements at the cottage you book at Abbott Mount. As for the indigenous Pahadi cuisine, there are plenty of roadside eateries and restaurants at Lohaghat Bazaar, just a stone’s throw away (okay, 7km) from Abbott Mount. The picturesque Abbott Mount was founded by an English businessman called John Harold Abbott in the 20th century. It is said that Mr. Abbott who wanted to make a European settlement, bought the Raikot Tea Estate from Rev. Bose that graciously sprawled over 1,000 acres of land. Though the tranquil place was discovered in the early 20th century, but even today one can spot the lavish European bungalows garnered with well-manicured gardens and orchards. As you explore the ramparts of the Kumaon Himalayas, you’ll probably come across a mystical place called Abbott Mount. This crescent place overlooks some of the world’s magnificent mountain ranges. You can have an admirable view of the quaint valleys nestled in the Shivalik mountain ranges of Pithoragarh in north and Nepal to its east. One can also see the silhouette of the Nepal Himalayas in the morning. If you are a cricket lover then there is a surprise waiting for you at Abbott as it has an old cricket pitch and at a little below 7,000 feet and enjoys its reputation as the second highest in the world, after the pitch in Chail, H.P. What is Abbott Mount famous for? Abbott Mount is famous among tourist as Hill Station. Abbott Mount is recommended destination for Couples, Family and Kids, Foreigners, Solo. Abbott Mount is popular destination for following activities/ interests - Bird Watching, Hill Station. Travelling to Abbott Mount in 2019? Contact us for planning your Abbott Mount tour with best travel packages of as per your requirements!